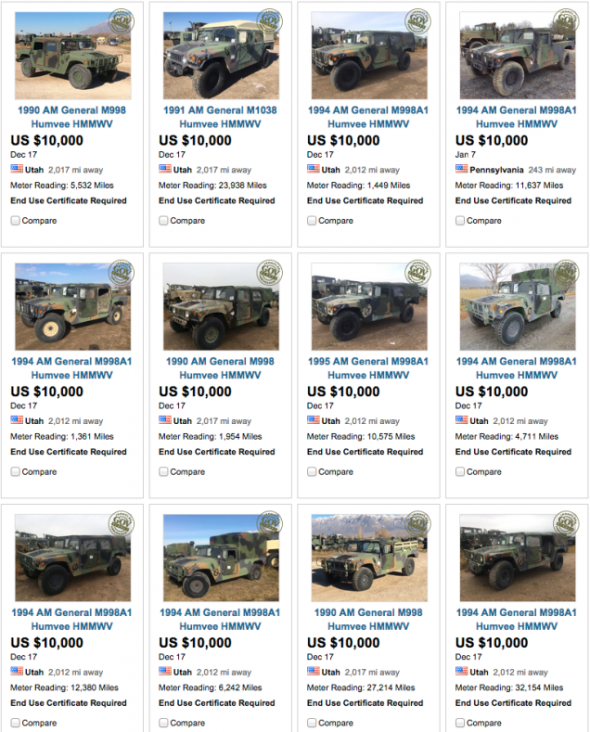 Starting tomorrow, 4,000 Army Humvees will begin to be auctioned to the general public starting for as low as $10,000. The in-person auction will be held at the Hill Air Force base in Utah, but that doesn’t limit your potential to get in on the action. Anybody looking to put out a bid can check out the listings and place a bid from their computer right here. As you can see on the listing, some of these monsters are up to 25 years old. But that’s nothing to worry about; it appears that they all are in great shape with low miles. Sounds great, right? Well, there are a few catches. Making things a little bit strange, the sellers are also asking that each buyer submit a note along with their purchase describing exactly why thee Humvee is being purchased and how it will be used. Do they want that signed by Mama, too? Apparently, the government is worried that these things could help some lunatic get their rocks off. This entry was posted in Culture and tagged humvee, military. Bookmark the permalink.